When we first met Dr. Emily McBride In Urban Tigers: Tales of a Cat Vet, she charmed readers with stories from her first year at the Ocean View Cat Hospital in Nova Scotia, Canada, owned by the flamboyant Dr. Hughie. In Urban Tigers Two: More Tales of a Cat Vet, Emily’s adventures continue. There’s plenty of heartbreak in this book – that’s the nature of a life spent working with animals. But the book is also filled with lots of smiles and sometimes laugh-out-loud humor. What I loved best about the book were the cats. I fell in love with many of them, but my absolute favorite was a little black stray who literally knocked on the door of the hospital one ay. When the receptionist opened the door for her, she “…rushed inside, her tail upright in the high noon position. In an outpouring of gratitude, she wrapped herself around Bernie’s legs and purred.” RosaLeigh, as the clinic staff named the little cat, has multiple severe health problems. She quickly wins over the entire clinic staff, and gets the help she needs, sparing no expense. And just when I thought I couldn’t love this little cat any more, she pays all the kindness she received forward in a way that will bring tears to your eyes. Urban Tigers Two is a novel, but it reads more like a memoir. It’s like a modern day feline version of the James Herriott stories, and just like the James Herriott stories, this book is full of joy, sadness, humor and compassion. It will leave you with that warm fuzzy feeling you get after reading a really good book, and it will leave you hoping that there will be another sequel. 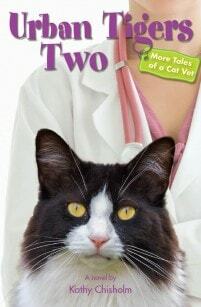 If the cat on the cover looks familiar, it’s because he’s somewhat of an internet celebrity. Tuxedo Stan ran for mayor of Halifax Regional Municipality in Nova Scotia, Canada, on a platform of raising awareness about the tens of thousands of stray cats in the area. As Urban Tigers Two went to press, the city council voted to increase financial support for the SPCA for a low-cost spay and neuter clinic. In January of 2013, Stan was diagnosed with renal lymphoma. He is fighting this personal battle with the support of his veterinarians and the thousands of friends he’s made all over the world. Kathy Chisholm is an award-winning author. In 1987, she and her husband, veterinarian Hugh Chisholm, established the Atlantic Cat Hospital, one of the first feline-only practices in Canada. They live in Nova Scotia with five cats, two dogs, two guinea pigs, and a fluctuating number of fish. For more information about Kathy and her book, please visit her website. This book was sent to me by the author. Receiving the complimentary copy did not influence my review. This sounds like an interesting book! Though not keen on the sad parts, any book that is a modern James Herriot in style must be great! I loved the first book and, based on your review, will most likely love the second one as well! Thank you for the review. Sounds very good. Will have to check out the first one too.